You are here: Home / Publication / Yes, they arrived: cheap affordable ways to measure color! Ford once said: “you can get any color for your car as long as it is black”! Well, a lot has changed since then… There are so many colors available now that we need digital means to measure them. 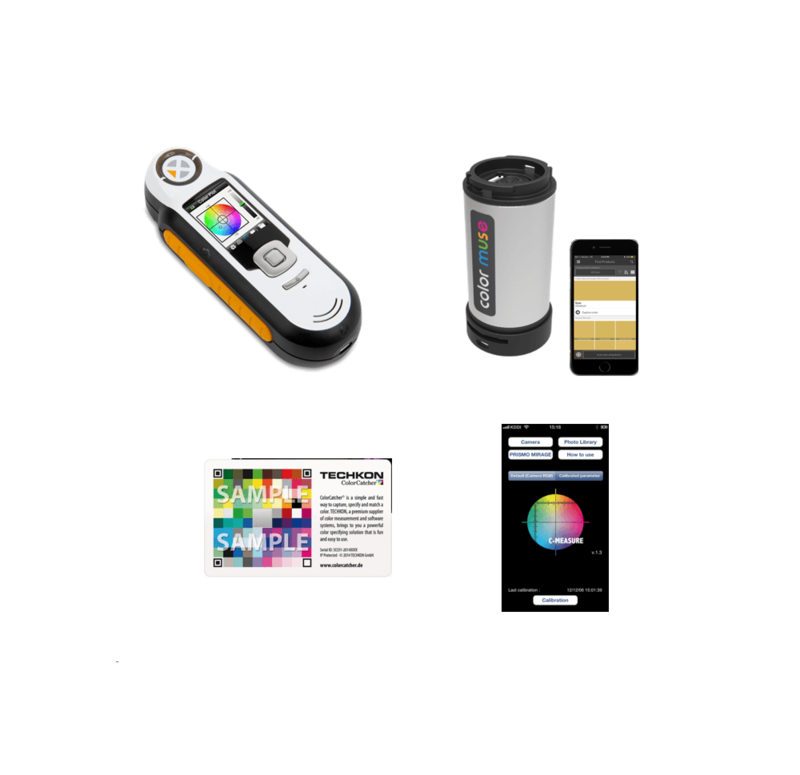 ew exciting low cost devices to measure color digitally. It explains the different types and what to expect. If you read this, you made the first step to understand these devices and you will be ready to take the next steps towards purchase decisions for yourself or your company. Finding the color for a wall, a piece of furniture or apparel is not an easy task. Although a fan deck with color chips is often available for professionals it is not very easy to visually determine the right color. Experience is needed together with proper lighting of the sample. Devices for measuring color are usually quite expensive but in the last 10 years low cost devices with specific functionalities entered the market and new developments are added every year. The price ranges from €/$ 50 – 700. The devices carry alluring names like Nix, Nano, Capsure, Node, Cube, Helper, Muse etc. We call this group of devices: “Low Cost Color capture Devices”. LCCD’s can roughly be characterized as small color retrieval devices which (1) fit easily in a pocket (2) are easy to use (made for pro-sumers) (3) Retrieve colors by list look-up (4) use LEDs as light source, (5) have a small fixed aperture (6) do not measure a full spectrum (like a spectrophotometer does) (7) and of course are low priced. Most (newer) devices use Android/iOS Mobile smart phones as interface (apps) and provide collections and updates. Most (newer) devices communicate wirelessly by blue tooth. Especially the newer devices look flashy and usable. The new Color Muse from Variable Inc. has a very low price and could be called disruptive for this market. It sure is a cute device but the other devices have important USP’s as well. What is the main user scenario? Main user scenario is based on a professional or prosumer who wants to have specific information about a particular physical color. In case of a professional painter, an architect or designer he/she wants to know the reference chip in the color fan deck that matches best with the physical color. It is possible he/she wants to know this for a multiple number of fan decks at the same time. Sometimes additional information is needed like inspirational color combinations, additional color descriptors like RGB, CMYK or HEX or even a location where paint quickly can be ordered. In each scenario, the optimum between functionality, form factor, ease of use and price/costs is very important. Certain aspects of the user scenario can have profound impact on the usability of the instrument. The combination of these considerations makes a unit fit for your purpose. Prices vary as mentioned earlier between €/$ 50 to 700. Some of these units will have problems to stay on the market because their distinctiveness is not high enough. Is there still room for cheaper devices that will also appeal to consumers on a large scale? It is not sure what this magical consumer price is but in our view, it must be sub $50. For prosumers and professionals, the current prices are acceptable in my view. There are different ways to build these devices. Four basic forms can be distinguished: stand alone, device in combination with app, calibration card and app only. The basic form will be very important for a user to decide for a certain instrument. LCCD’s work with different lighting and detection mechanisms. Depending on these technologies they are suitable to measure certain samples with more or less success. In the table an overview of these possibilities. A thick mark does not mean that all colors in a certain category can be measured with the same success but at least partly. Some surfaces are quite complicated. None of the LCCD’s is capable of measuring effect coatings like metallic and pearls, this requires so called multi-angle color measurement (pdf). The software accompanying the devices whether in form of an app or on board in case of a standalone device determines for a big part the possible user scenarios of the device. Another important point is the data available in the form of digital fan decks. Manufacturers of these devices work hard to make as much color fan decks available as possible. 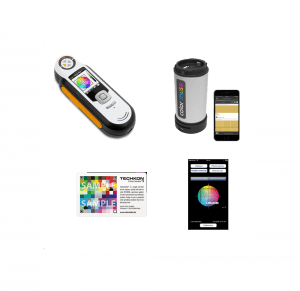 For companies the digital color fan deck management of the devices can be important to distribute the correct digital fan deck depending on location and brand. Possibilities for the customers to program the devices based on an SDK can be very important as well especially for larger companies. Roel Gottenbos is developer of game changing color tools and an experienced color research manager. He helps companies to improve their color processes from raw material to end product. At least 12 Color Metamerism types! What is wrong with automotive color data?